The founders of the Ride On! 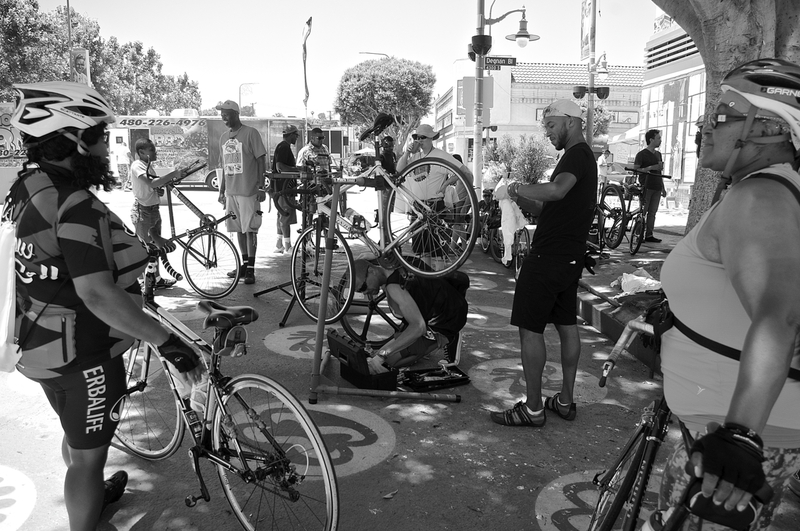 bike co-op and members of Black Kids on Bike gather in Leimert Park to host an open-air tune-up session. Sahra Sulaiman/Streetsblog L.A.
Back in January, the young man and three of his friends — all experienced cyclists — had taken the opportunity to join the Black Kids on Bikes‘ (BKoB) parade “float.” It was a pretty informal affair, essentially consisting of the group riding in slow circles along the parade route, occasionally doing tricks, and letting community members try out their bikes, if they were so inclined. 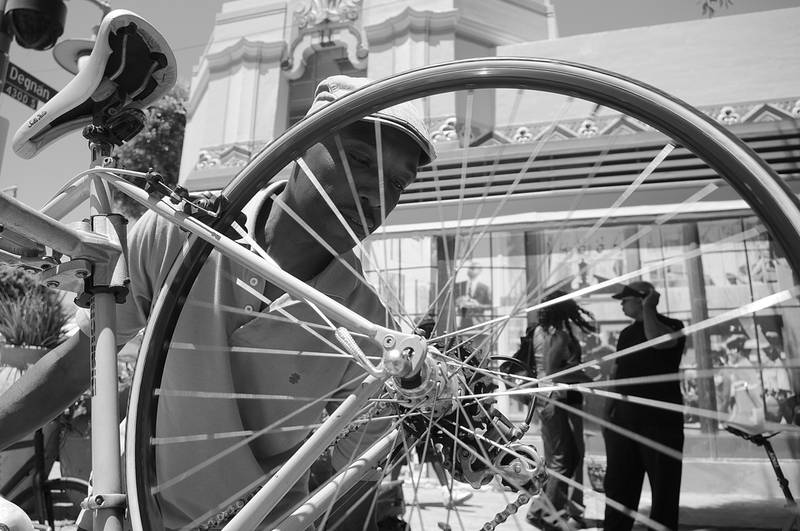 The larger goal was to put a young and dynamic face on cycling in the South L.A. community, both to change negative stereotypes around cycling and to attract new people to the movement. And it was all going very well until an overzealous police officer used the helmetless Wright and his friends as an excuse to stop and harass the group, asking if they were supposed to be there. Minutes later, that same officer stepped in front of the Real Rydaz, claiming he had to stop the bikes because of the kind of “chaos” that kids like Wright and his friends were causing. “I still don’t have a helmet…” Wright nodded. 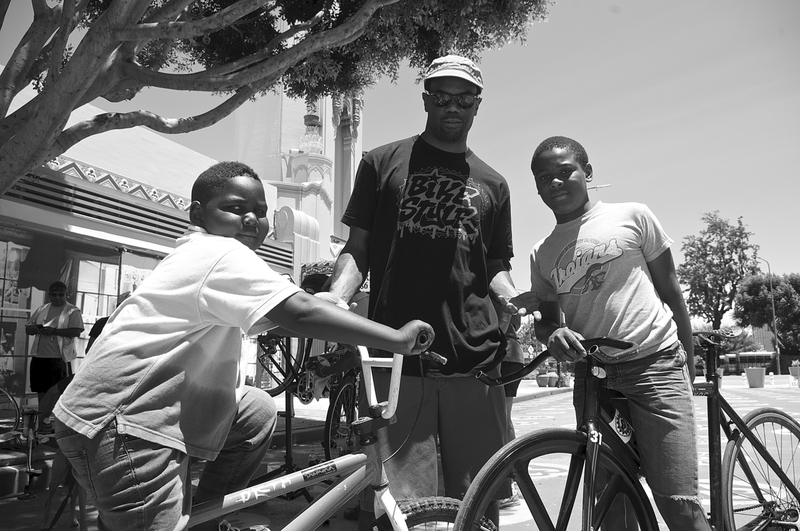 But he had stayed connected to the Black Kids on Bikes — a group he looked up to — and jumped at the chance to hang out with them when he saw the notice about the free tune-up session in Leimert Park hosted by Ride On! posted on the group’s Facebook page. It was easy to see why. When I arrived a little after noon yesterday, the plaza was bustling. Erik Charlot (left) works on a bike while chatting with some of the lovely ladies of Major Motion. Sahra Sulaiman/Streetsblog L.A.
Music blared from some speakers set up at the corner by some of the weekend vendors and the DIY co-op was in full swing. Members and their supporters had brought their portable bike stands, tools, and cleaning supplies from home and set up under the shade of the plaza’s enormous fig tree. 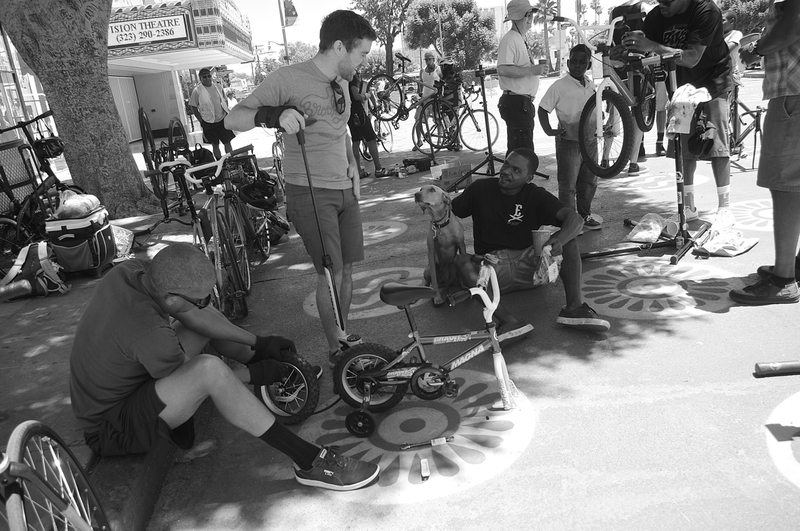 Michael Glasco, Michael MacDonald, dog Tobey, and Malik Mack make sure a tiny bike is in working order. Sahra Sulaiman/Streetsblog L.A.
As the group grew in size, so did the sense that a community was being built. Parents came by with their kids’ bikes, people dusting off old or recently-acquired bikes wanted help making them made road-ready, cyclists from groups like Major Motion came by to get a tune-up and talk riding, and folks who had recently taken up cycling stopped by to celebrate the benefits they had gained from starting to ride to work or on Saturday mornings with friends. Cortez Wright watches BKoB members Mike Glasco (second from left) and Tony Kee (at right) help someone fix their bike at a tune-up session. 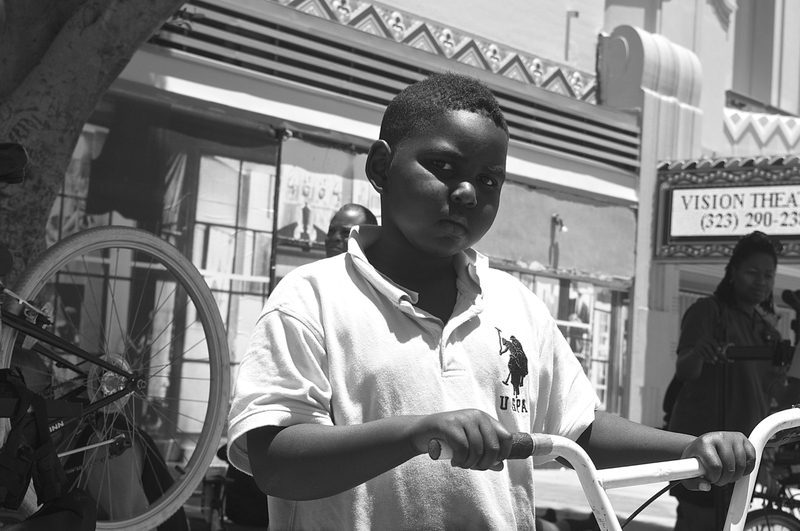 Sahra Sulaiman/Streetsblog L.A.
My favorite visitor had to be a 7-year-old boy who was riding a bike that was far too big for him. The son of a vendor working in the park, he had found himself with nothing to do but pedal around the plaza while he waited for his dad’s day to finish. Only 7 years old, a guarded little boy had some very clear ideas about what should happen to his bike. Sahra Sulaiman/Streetsblog L.A.
BKoB co-founder Jeremy Swift and some of the other members convinced the boy to let them make some adjustments on the bike. The boy was reluctant at first, only allowing the seat to be adjusted and preferring his handlebars to be pointing forward, even if it meant that it was awkward to reach them. But after Swift worked with him for a while, teaching him how to do things like oil his chain, the boy let his guard down a little and began to trust that the adults were only trying to help him. 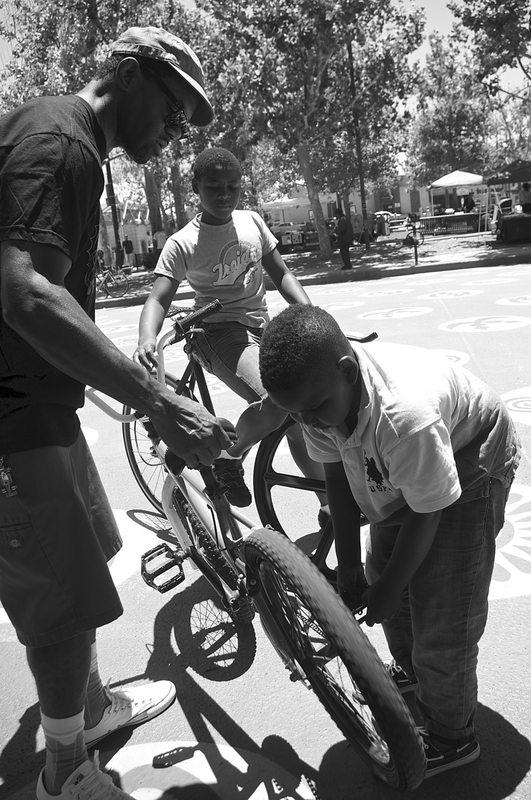 Jeremy Swift teaches the boy to work on his bike while Cortez Wright watches. Sahra Sulaiman/Streetsblog L.A. Satisfied his bike was now road-worthy, the little guy turned to Wright — a speedy fixie rider who occasionally races with the Wolfpack Hustle — gave him a very serious reverse nod and issued a challenge. Jeremy Swift with Cortez Wright and the soon-to-be road warrior. Sahra Sulaiman/Streetsblog L.A. The session went on til well after 2 p.m., more than an hour longer than it was scheduled for. Ade Neff, founder of Ride On!, works on wheel. Sahra Sulaiman/Streetsblog L.A.
With the pending arrival of the Metro station and talk of bike hubs being sited at high-demand stations, it would be fantastic to see support for co-ops in communities of need be included in those conversations. In the meanwhile, you are welcome to join Ride On! and BKoB at the site of the new and beautiful People St Plaza (43rd Pl. and Leimert Park Blvd.). They plan to hold free tune-up sessions every other Sunday or so, starting at 11 a.m. 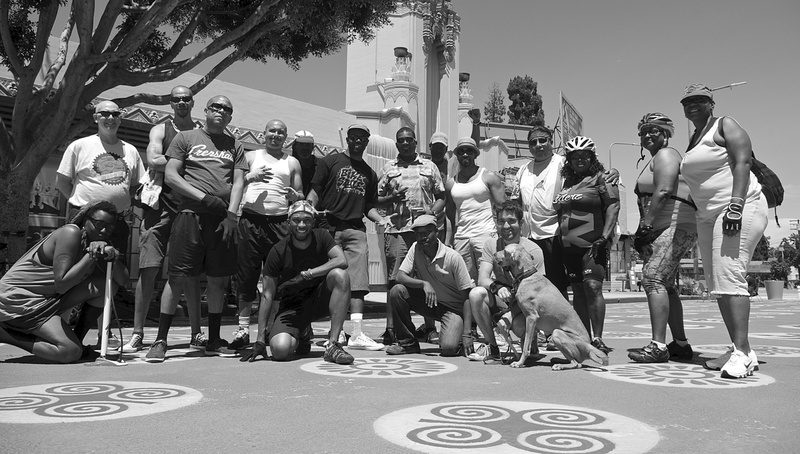 The next session is set for Sunday, July 26, and coincides with the Leimert Park Art Walk (2 p.m.) and the monthly BKoB ride (1 p.m.). So, come support the co-op, get a tune-up, check out the art, go for a ride, or some combination thereof. Ride On! and BKoB members and some of the folks they helped out. Sahra Sulaiman/Streetsblog L.A.
Nice writeup! I think this is the first time I read about possibly having a bikehub at a Metro station. Seems like it’s a no-brainer. It has been shown in other countries to be a great spot for on the road repair stops. Plus there’s plenty of room at some of the stops. the growth of a neighborhood bike org is so exciting. this is great community work with good vibes all around. this has the potential to become an institution, like Kaos network, etc. I hope they can host a dedicated facility like Bicycle Kitchen someday – if that’s what they want. I would more than welcome that! !